The “Centro Cultural de España en Nicaragua –CCEN-” (Cultural Center of Spain in Nicaragua) is one of the most dynamic public open spaces in the capital city, thanks both to itsr full weekly schedule of activities and its spaces with different environments and facilities. Concerts, photo exhibitions, recitals, film screenings, workshops, courses and discussions are part of the wide range of the center, which completes with the free services of the Media/Library and its Laboratory of new technologies. Housed in a modern and fully functional building in a quiet residential part of the periphery, the center is part of the “Agencia Española de Cooperación Internacional para el Desarrollo -AECID-” (Spanish Agency of International Cooperation for Development), is associated with the Embassy of Spain in Nicaragua and is a member of the network of Spanish Cultural Centers abroad. At the same site also work the “Instituto Nicaragüense de Cultura Hispánica -INCH-” (Nicaraguan Institute of Hispanic Culture) and the Nicaraguan Academy of Language, although each operates independently. The CCEN's spaces are available for artists, groups, students, organizations and experts who wish to hold events or training courses, as long as -must be detailed-, the themes are consistent with the issues of the center: culture, human rights, development, environment, among others. The center also has free wireless internet. The spaces offer panels for exhibition, small stages, projection screens, chairs, reading areas; even, the center has a sophisticated audio system for sound interventions. To manage spaces, you must use the query tools to its sitio web (in Spanish). The place has its own secure car parking, which can even be used for events such as concerts. The opening hours of the CCEN are Monday to Friday form 9 AM to 6 PM. This space is active all the time. It is an indoor lounge, heated, rectangular, with a small platform at one end, exhibition panels, lighting and audio equipment. It reaches 180 people in chairs. Very often there are photo exhibitions, film screenings, workshops, among others made here. In addition to Spanish-American literature, here there are also available publications -including magazines- specialized in topics such as social sciences, various branches of art, gender and several others. It works under the modality of "open shelf" and, in addition to copies ready, it has other consultable publications in the warehouse, searchable through the catalog. It has 12 spaces for literary research and 3 seats for Internet use with computers included. In addition to printed publications, it offers its collection of videos and Latin American music. To borrow books for home use, you must become a partner through a free and dynamic demarche. Also this space is used for events such as thematic discussions or read cycles. Here you can see a complete profile of the Media/Library of the CCEN. 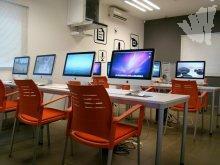 The modern new technologies laboratory has its 8 basic computer available without charge, its 2 computers for professional audiovisual editing, as well as audio recording and photographic equipment (including lighting). The use of space and equipment must be requested by an application through the web, but every artist, student, enthusiast or organization will have access to these technologies, as long as they are in line with the topics of interest of the center (which we mentioned above). In the laboratory there are regulary training workshops also developed. In the back of the building is the shaded terrace overlooking the courtyard of the CCEN. This whole area works in the summer for massive events. The covered terrace is common space for events up to 70 people, and there are graphic exhibitions organized on the walls, it also works perfectly as a stage due to its lighting features and audio. In front of it, in the open courtyard it can reach an audience of 300 people, or even more if the dynamics does not need sitting spectators. The CCEN is located just 7 blocks east from the first inning of residential Las Colinas, located at kilometer 8 of the well-known Carretera a Masaya (road to Masaya). On your own car, take the highway to Masaya and locate the entry, just recognizable because there are two large gas stations (petrol stations). Go into the street to the east and follow for 7 blocks (sometimes there are curves) until getting to the CCEN. For ease of reference, consult the map available above by clicking the globe icon. By Public Transportation from Managua, you can take a taxi from anywhere indicating the direction of CCEN. In buses, one way is by taking any bus intercity connection passing through the highway to Masaya (bound, for example, Masaya, Granada, Rivas) and get down in the first inning of Las Colinas, and then walk the remaining 7 blocks. These buses leave the terminus of the UCA, Huembes Market and Orietnal Market. If you want to avoid the walk, one option is to get off at kilometer 8.5 (opposite a small shopping center at the entrance to Santo Domingo) and then take a motorcycle taxi (caponera) to the CCEN. If you are coming from outside Managua, any bus to the city and that drives along the Masaya-Managua road will pass exactly opposite the first entrance to Las Colinas, you must only ask the driver to stop there.